Tips and tricks to solve some troubles of WHATSAPP applications. What is Whatsapp? This is the popular chat applications in the world. It have many interesting features and always developing with latest and new features to make more capabilities. At beginning, basic Whatsapp features are for Personal and Group Chat or multiple devices, and now they have more interesting features for each services. Where Can We Install WHATSAPP Applications ? WHATSAPP initially design for Android, iOS, Windows Phone, Symbian. But now only latest version of operating system can work with Whatsapp, therefore we have to upgrade our smartphone if we still use old version one or when we get incompatible version. We can also use WHATSAPP from smartphone and computer together. How to Install WHATSAPP at computer ? We can use WHATSAPP from computer, this is what we really like from this apps, we do not need to install any additional applications to chat from our computer. Just use latest update browser from our computer such as Google Chrome or Mozilla Firefox or Microsoft Edge or Apple Safari then we can use almost all features from this chatting applications. We do not need to worry about our personal computer (pc) operating system, because it can run smoothly at iOS iMac, Microsoft Windows and Linux/Ubuntu. But we still have activate the WHATSAPP from smartphone before it can run from computer, the chat content will synchronize automatically between computer and smartphone. Computer and smartphone need to work together for Whatsapp Web. To make this steps easy to follow, we will give color differences for step by step procedure bellow. Red is for computer steps and Blue is for Smartphone steps. Whatever we type either from computer browser or WHATSAPP apps from smartphone, each device will sync chat content automatically. 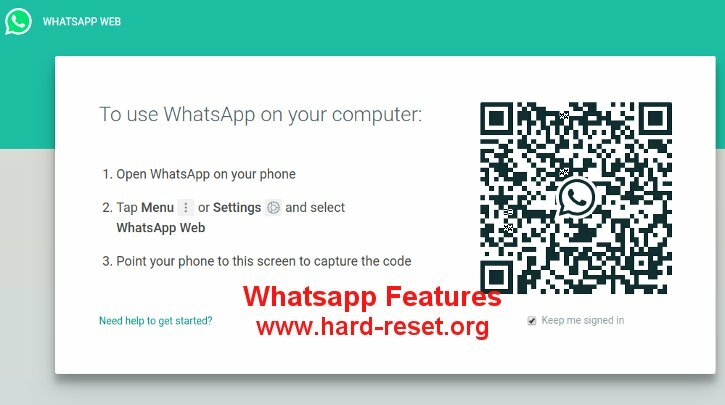 How to Simply Backup and Restore WHATSAPP Chatting History and WHATSAPP Contact ? Performing hard reset or master format of our smartphone (Android or iPhone) will make all chat data wipe/remove as well. Therefore we have to backup all data safely. WHATSAPP by default will do daily backup automatically at 2.00 AM – 4.00 AM everyday. The auto backup time may different at other WHATSAPP versions. It will create files at local storage. At Android smartphone, we can find WHATSAPP local files at folder /Whatsapp/Databases/ folder. Chat backup files are encrypted safely but media files (pictures / movie) from chatting are not encrypted at /Whatsapp/Media/ folder. How to Backup and Restore WHATSAPP data at Cloud Storage. When we use WHATSAPP Android, then we can backup and restore all data to Google Drive. When we use iPhone, then the data will be backup to iCloud. All Cloud Backup will follow the free storage availability from each account. If our cloud storage capacity are full, then WHATSAPP backup will not work. Make sure our Good Drive or iCloud backup is setup properly from this screen. How to Restore WHATSAPP cloud backup to our Android or iPhone ? How to Restore WHATSAPP local files to our Android ? WHATSAPP will ask to restore local storage backup when it find backup files at /Whatsapp/Databases/ internal folder. When we make this information, Whatsapp and Google have new agreement that all Whatsapp users who backup their chat and photo video to Google Drive will not count together with personal storage limit (usually by default we will get 15 GB free storage for all Google data including email, files and some other more), therefore if we have many group chat and photos/videos which need to backup to Google Drive, will get unlimited backup storage as long as that user use Android smartphone. Please note, for all users who never connect to Google Drive for Backup the Whatsapp within 1 year, then the backup data will be remove from Google Drive server automatically. Please note, all information above will get some different steps or procedure depend on WHATSAPP version. Because this apps always get new upgrade for improve some features. How to Easily Master Format MOTOROLA MOTO G / MOTO G DUAL with Safety Hard Reset? How to Easily Master Format MOTOROLA MOTO G4 (PLUS) with Safety Hard Reset?